Belgium will be without captain Vincent Kompany when they host Wales in their Euro 2016 qualifier on Sunday. The Manchester City defender missed the 2-2 Premier League draw with Queens Park Rangers last weekend. The centre-back also sat out Belgium's friendly with Iceland on Wednesday and manager Marc Wilmots said a scan showed his calf injury is worse than expected. "The news is bad and Vincent is out for at least 10 to 12 days so he can't play on Sunday," Wilmots said. "I told the team it's a shame but it's not a problem, there are solutions." Chris Coleman's Wales top Group B going into the match with the World Cup quarter-finalists in Brussels. 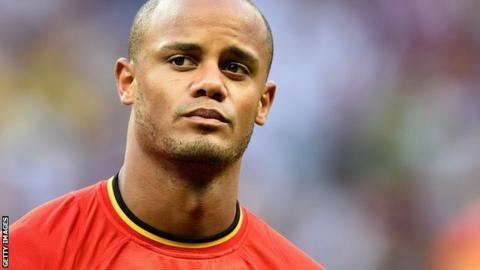 However, former Belgium and Newcastle United defender Philippe Albert believes the loss of Kompany will not weaken Belgium too much for the game. "We've got some quality defenders: Toby Alderweireld is playing fantastically well at Southampton and he will play alongside Nicolas Lombaerts probably," Albert told the BBC's Sport Wales programme. "It's obvious we will miss Kompany because he's a top-quality defender, one of the five best in the world, but if he's injured we'll have to do so."